The Prime Minister urges the Radical Party and "Self-Help" to return. 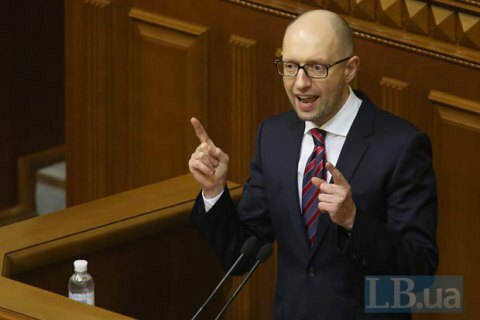 Prime Minister Arseniy Yatsenyuk thinks that there are three ways out of the political crisis nowadays. "The first variant is that one offered by me, i.e. to restore the coalition activity, to reform the membership of the Cabinet of Ministers and move forward conducting reforms, as there are no alternatives existing. The second option is when President of Ukraine and the Petro Poroshenko Bloc take the responsibility on the formation of the new Cabinet of Ministers, a new programme and coalition and present it to the people of Ukraine. The third variant is the most unacceptable one – these are early elections. I think that one of these three variants is to be chosen as soon as possible," Yatsenyuk told journalists in Kiev on Wednesday, Interfax-Ukraine reports. Yatsenyuk finds the first variant to be priority. At the same time, he urges the Radical Party and "Self-Help" to restore the activity of the Parliament’s coalition. The Prime Minister did not mention "Fatherland".